At GitHub Universe 2016 in San Francisco, Gregor Martynus of Hood.ie said: "Code collaboration is no longer the problem." I agree, and a problem I see in the open source community centers on collaborating on artwork, logos in particular. I don't think it’s a platform limitation (GitHub, etc. ), I think it’s a lack of art directors. By definition an art director is someone who is responsible for the visual style and images created for a project. An art director creates the overall design and directs others who are part of the project to develop artwork or layouts. To have any success as an art director in open source I’ve found the following characteristics are needed: an eye for design, open mindedness, and patience. To help illustrate this point, I'll present two projects where I have made art direction contributions. One was a failed attempt, the other was a success. In 2013, @TwitterOSS asked if anyone was interested in creating a new logo for the Apache Pig project (tweet since removed). I didn’t hesitate to get involved. I had an idea of what the logo could look like, so my employer at the time (MaxCDN) allowed me to hire an illustrator to portray it. Here’s how I failed. I didn’t reach out to a project committer/stakeholder before I submitted my idea and work because I assumed I knew what they wanted from looking at other Apache projects. If I were to do it over again, I would have done some research. At the time, I just knew the project was associated with Hadoop, so I thought if Hadoop had a cute elephant, then Pig would have a cute little pig and we could call it a day. In reality, that wasn’t what they were looking for, and I wasted $300 on an illustrator coming up with something they didn't even consider. 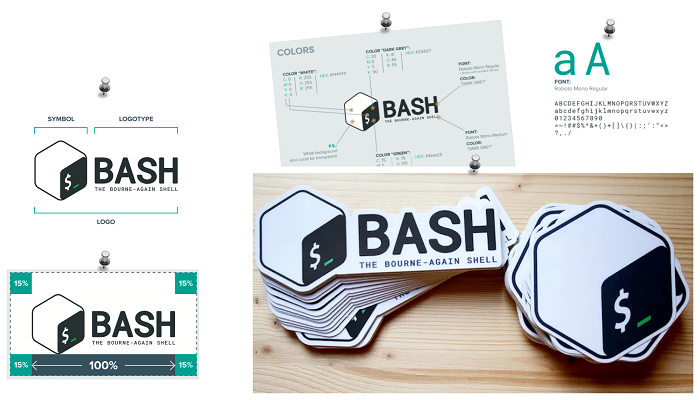 As popular as Bash is, it has never had a true visual identity. So in 2015 I reached out to Chet Ramey to see if I could help redesign a modern logo that anyone could use for digital or print. Once I got his blessing, I went to work and hired a design firm. The designer produced a few iterations that I found intriguing, and I made a few edits before sending it to Chet. To make a long story short, it was a no go. The lesson I learned here was that if you are working with a designer for the first time, ask that person if they have done anything similar before. 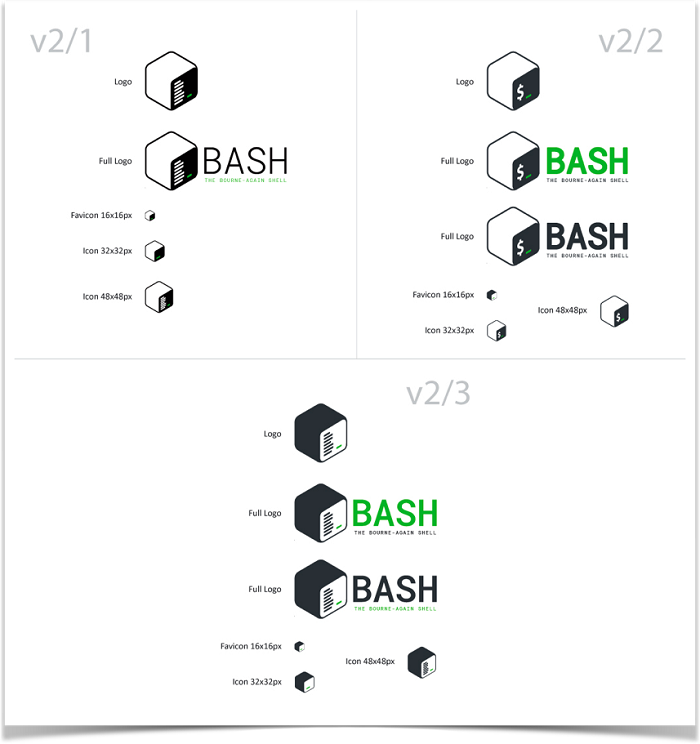 The previous logo for BASH, which existed for 20 years. The next firm I hired, ProspectOne, understood the project and the audience. Not only do they design logos, but they host IaaS open source projects, which you don't find that too often. We were ready for community input, so I created a poll and Chet posted the link to the GNU Bash mailing list asking members to promote the poll. 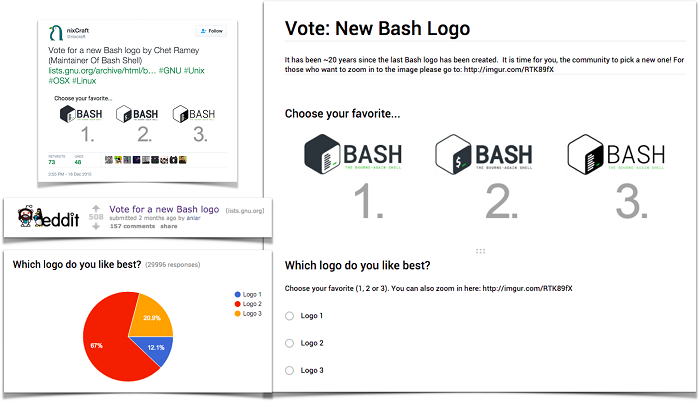 30,000 votes later, and GNU Bash had a new logo. This attempt at a new logo design was a success because I started a dialog with the person chiefly invested in the change (often the project maintainer), and I was patient with the process. Good design takes time. This entire process from the first email to the announcement of the winner took six months. Also, I maintained open-mindedness. Even though I was acting as the art director, I still needed to look at things from a different point of view. It would have been easy for me to demand my way, but I wanted Bash to have an identity that users and fans would be proud of, and in order for that to happen I needed to have an open mind. This was hard to do! Make sure you work with the stakeholders in the project to understand the goals and audience of the project. Don't rush to find a designer, you need to find the right one who understands your audience. My grandfather, who was a small business owner, told me time and time again that "business is people and relationships." As I grew older I found out the same concept can be applied to the open source community. To be a contributor, you don’t need to understand what a binary tree is to make a big impact on a project or the open source community as a whole, but you do need to work within the community. If you or someone you know is interested in Open Source Design and has experience in art direction, there are many projects that need your help. This post is dedicated to the memory of Michael C. Gross. Justin Dorfman - Justin is heavily involved with the FOSS community contributing to Bootstrap, Font Awesome, Grunt, jQuery, Twemoji, Nginx, GNU Bash, and many more. He also serves on the Selection Committee for Mozilla's Open Source Support (MOSS) program, as well as the Open Source Collective's board of directors. In 2017, he co-founded/organized Sustain Summit, an annual one-day event for Open Source Software Sustainers. Love the new logo. How do I get a stack of those sticker please?